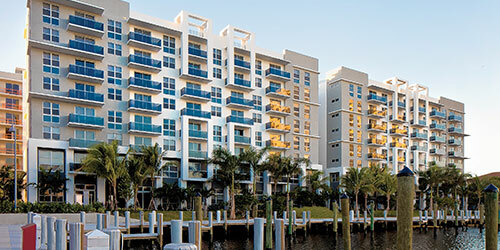 Modera Port Royale, a 555-unit luxury apartment community at 3333 Port Royale Drive South in Fort Lauderdale, has officially opened for its first residents. The waterfront project, by Dallas-based Mill Creek Residential, is comprised of five eight-story buildings with studios and one-, two- and three-bedroom apartments. Unit features include quartz countertops, stainless steel appliances, 42-inch custom cabinets, French door refrigerators, nine- to 14-foot ceilings, frameless glass showers, plank-style tile flooring and movable chef islands. Community amenities include a boat-viewing room, two amenity decks with outdoor kitchens and barbecues, a fitness center, pool, clubhouse, game rooms, business center, movie theater and cyber café. There are also 42 leasable dock slips that can accommodate boats up to 40 feet. Rents range from $1,811 to $4,350.